My daughter Luna is now eight months old, chubby, with a wide-mouthed smile and bright eyes. I’m here to study community responses to youth “return” from the United States and Mexico—return often, although not always, being a sanitized word for deportation. We have been in Guatemala eight weeks now, long enough to begin settling in, and slowly to understand the vastness of what I don’t understand. I have learned that it is nearly impossible to anticipate the daily realities of any massive life change—this was true when I started graduate school, when Luna was born, and now, as we live together in Guatemala. No amount of reading, planning or mild obsessing sufficiently prepares for the future—I had notions of how it might be to conduct field work as a mother, but they were spectral in comparison the texture of everyday life here. Washing diapers at the pila. Like many Guatemalans, we use cloth diapers. For most Guatemalan parents this choice is financial—disposable diapers are incredibly expensive. Our choice, on the other hand, stems from the privilege of having the time to worry about the environmental impact of diapering. Regardless of motivation, I find myself sharing an unanticipated daily activity with local mothers, washing soiled diapers by hand. Pilas are constructed out of cement. In Xela, where we live, Guatemalan’s who have running water often have one in the patio of their house or apartment. People who don’t have running water, or who don’t have a pila at home, do their wash at the community pila right next to a new fancy grocery store. Easily the size of a swimming pool, upwards of 40 people can wash and bathe there simultaneously. Taxis wait in the makeshift dirt parking lot to carry people home with their piles of wet laundry to be hung. The family we lived with for the first few weeks has their own pila in the house, a few days after our arrival our house mom, Maria, told me I was welcome to use it to wash Luna’s diapers. Energized, I walked downstairs the dirty diaper bag in one hand, and Luna on my opposite hip, ready to start the process. I figured it would be self-evident, wet the diaper, soap the diaper, scrub the diaper, rinse the diaper, and repeat. I began the process with Luna still balanced on my hip. I put a diaper on the cement washboard and gingerly began rubbing the soap in with my free hand. Our house-father walked by, he paused, watched me for a second, and then turned to say something to Maria in the kitchen. As she came scurrying out, “Ket me do it, watch and learn,” she said as she removed the soggy diaper from the washboard and filled a big plastic basin with water and detergent. She showed me how to take the soapy diaper out of the water and aggressively use both hands and her entire torso to rake it across the washboard over and over again before ringing it out and placing it in a pile to the side. 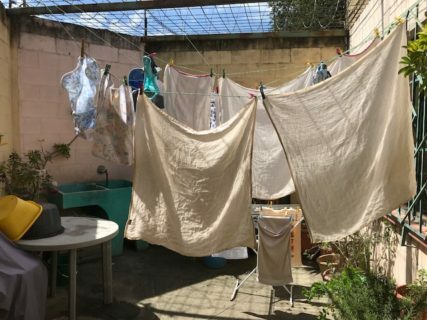 When all the diapers were scrubbed, Maria filled the pila with fresh water and began the same process over again, this time rinsing each diaper until they were soap free, wringing them out, and putting them in a basin to carry upstairs and hang to dry. The movement is incredibly physical, and I realized how silly I must have looked trying to wash the diaper with one hand while holding Luna, rubbing it across the surface as if I were wiping down a table. The next night, I left Luna with her dad and washed the diapers. The rhythm was hard to manage and the movement grueling. When I tried to speed up the process, I would rake my fingers against the cement and have to slow down again. Maria checked in on me and we laughed about how my shoulders and back would hurt in the morning. Fifty minutes later, I had a clean pile in front of me waiting to be hung on the roof. Exhausted, I didn’t know how I would find time to write my field notes. Between nursing, diaper changes, bedtime routines, and now, diaper washing, I find myself wondering where the time goes. Women here manage so much more than washing an entire family’s laundry by hand. Everyday Luna and I encounter other mothers, their babies and toddlers strapped to their backs with a brightly colored rebozos—traveling on packed school buses that serve as “public” transportation, peddling all kinds of goods in the market, walking with carefully balanced baskets on their heads, rhythmically patting tortillas to sell for about four cents each. For many women I have seen, the work of mothering and working to earn money for your family are entirely integrated. When I bring Luna to my fieldsite, to a meeting, or an interview, I don’t get the sense that this is an inappropriate breach of boundaries—in fact, the days she doesn’t accompany me, the women I spend time with worry about where she is and who is taking care of her. I come from a country where women are often forced to choose between their careers and their children (particularly in academia), are penalized professionally for actively engaging in motherhood, and find huge portions of their salaries going towards the cost of childcare. I am living in a country where, for most women, but especially for poor women, the choice between mothering and working isn’t relevant—one does both simultaneously because the alternative doesn’t exist. Recently, I find myself wondering about the connections between these two realities that, while disparate on the surface, feel intimately connected in terms of the systems producing them. Briana Nichols is a PhD candidate in Anthropology and Education at the University of Pennsylvania. To submit a NAPA Section article, contact Rachel Hall-Clifford at [email protected]. I really enjoyed this piece. It took me back to 1974, when I went “to the field” with an infant (he had his first birthday on the West Coast of Vancouver Island). I had been to Kyuquot, the village where I was hoping to study oral history, a couple of years earlier and had a very hard time. Acceptance was much easier with my son, who made me seem like a normal person. And yes, cloth diapers were the bane of my life too, particularly as water was rationed in the village even though it rained a lot! Good luck with the rest of your research. Want to comment? Please be aware that only comments from current AAA members will be approved. AN is supported by member dues, so discussions on anthropology-news.org are moderated to ensure that current members are commenting. As with all AN content, comments reflect the views of the person who submitted the comment only. The approval of a comment to go live does not signify endorsement by AN or the AAA. Want to comment? Please be aware that only comments from current AAA members will be approve. AN is supported by member dues, so discussions on anthropology-news.org are moderated to ensure that current members are commenting. As with all AN content, comments reflect the views of the person who submitted the comment only. The approval of a comment to go live does not signify endorsement by AN or the AAA.